Ryan McHugh was key to reversing Donegal's fortunes today. 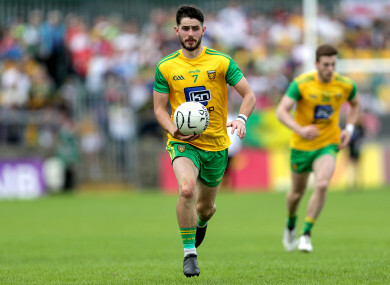 DONEGAL CAME FROM five points down at half-time to overcome relegation-threatened Cork as they stayed in the Division 2 promotion hunt with victory at Páirc Uí Rinn on Saturday. While Donegal led three times in the opening stages, they were unable to make their dominance count as Cork defended well, and three points in a row, from Ruairí Deane, Luke Connolly and Eoghan McSweeney, had them 0-6 to 0-3 ahead by the 22nd minute. Though Donegal cancelled out that lead through Michael Murphy, Caolán Ward and Ciarán Thompson but Cork finished the half well. They had a goal as Matthew Taylor netted the rebound after Shaun Patton saved from Ruairí Deane and McSweeney added a pair of smart points to leave them 1-8 to 0-6 in front at half-time. Collins made it a six-point game on the resumption but Donegal were more impressive in the second period. They scored six of seven between the 37th and 52nd minutes, with Murphy showing his class while Ryan McHugh was also on target. Connolly’s free levelled on the hour mark but it was to be their last score. Their cause wasn’t helped by losing captain Ian Maguire to injury with all of their subs used and a pair of Niall O’Donnell points gave Donegal a cushion before Cork were reduced to 13 as Mark Collins received a second booking. Ó Baoill extended Donegal’s lead before Jamie Brennan netted, having been set up by Caolán McGonagle, and Cork finished with 12 as Connolly was forced off injured. Ryan McHugh rounded things off as Donegal won by seven. Scorers for Donegal: Michael Murphy 0-6 (0-4 frees, 0-1 45), Jamie Brennan 1-2, Niall O’Donnell 0-3, Ryan McHugh, Daire Ó Baoill 0-2 each, Hugh McFadden, Ciarán Thompson, Oisín Gallen, Caolán Ward 0-1 each. Scorers for Cork: Luke Connolly 0-4 (0-3 frees), Eoghan McSweeney 0-3, Matthew Taylor 1-0, Mark Collins, Michael Hurley 0-2 each, Ruairí Deane 0-1. Email “Donegal overturn five-point half-time deficit to beat Cork and boost promotion hopes”. Feedback on “Donegal overturn five-point half-time deficit to beat Cork and boost promotion hopes”.